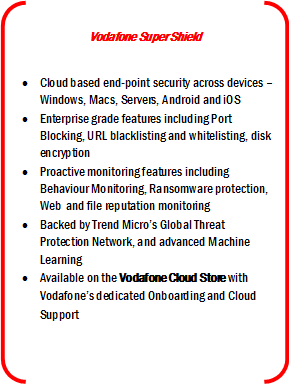 Vodafone has announced its partnership with Trend Micro to launch Vodafone Super Shield, a cutting edge end point security suite for businesses. Vodafone Business Services, the enterprise arm of Vodafone, provides total telecommunications solutions across both mobility and fixed line platforms and enables Global Enterprises, National Corporates, SME’s and Government segments to communicate, collaborate and connect. Through a dedicated team of Account Managers and Service Managers, it specifically addresses the connectivity, Internet of Things (IoT), cloud and converged communications needs of its enterprise customers. Vodafone Business Services was awarded the ‘Enterprise Telecom Service Provider of the Year – SMB Segment’ at the Frost & Sullivan India ICT Awards 2017 for the second year in a row. It was also awarded CIO Choice Awards for Enterprise Mobility and Leased Lines for 2017 and ‘Telecom Leadership Award 2016’ for IoT by Voice & Data.